Each year, the fund is holding a concert on HotRod's birthday to celebrate his life and his many gifts to the San Diego music community. 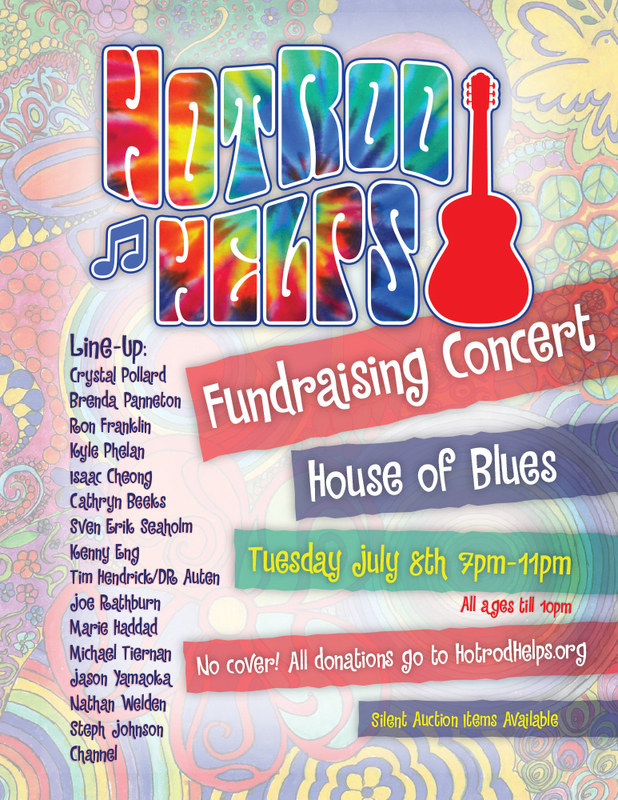 The 2nd Annual HotRodHelps.org Fundraising Concert is scheduled for July 8th, 2014. If you're attractive and/or friendly, you really should be a part of this awesome event. Suggested minimum donation of $5.00, but no cover! All donations will go to the fund. Show up. Be happy. Love music. Share your love. Hug someone [and mean it]. Donate from your heart [if your heart has any money it can spare, of course] knowing that we will put it to great use in our local music community. We're looking for donations to use as raffle prizes and give-aways at the concert. Think like gift cards/gift baskets/local music cds/etc... If you've got something you think would be a great fit, please use the contact page to drop a line. do you guys have a poster type thing? what about a totally rad video explaining the fund?